Place the blueberries, sugar and lemon juice in a small sauce pan. Bring to a boil, stirring occasionally, turn the heat down and simmer for about 5 minutes. Remove from the heat, let cool down for about 10 minutes and puree. Place on the stove again and bring to a simmer. In the meantime whisk the corn starch, egg yolks and 1 or 2 tablespoons water to obtain a paste. Stir this paste into the blueberry mixture in a thin stream and boil for 1 minute while whisking constantly. Remove from the heat and stir in the butter and the salt. Allow to cool, transfer to jars and keep refrigerated. Prepare and bake the cups following the linked recipe. Let cool down completely. To make the meringue preheat the oven to 200 degrees Celsius/ 390 degrees Fahrenheit. Spread the sugar on a baking tray lined with baking paper. Place in the oven for 5 to 6 minutes until the sugar is very hot (it should not start to dissolve). Reduce the oven temperature to 150 degrees Celsius/ 300 degrees Fahrenheit. Place the egg whites in the bowl of a food processor and whisk on high speed for a few seconds. Slowly add the hot sugar helping yourself with the baking paper. After adding all the sugar, whisk the egg whites for another 15 minutes until the meringue is shiny and cold. 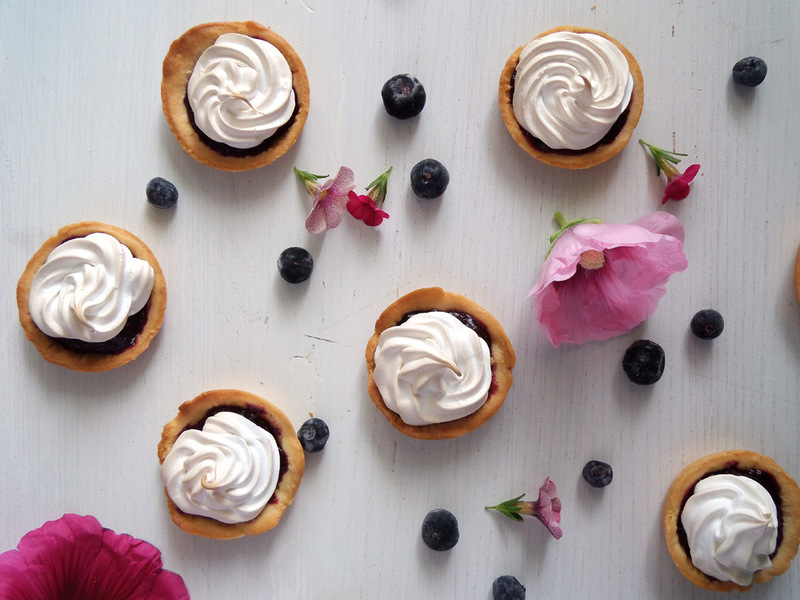 To complete the cups, fill the cases ¾ full with blueberry curd and pipe some meringue on top. Place the cups onto a baking tray and place in the oven for about 3 minutes until the top is lightly brown.